Bramell, Party of Five: When was the last time YOU did something important? When was the last time YOU did something important? Friends, I want to take a minute to let you know about this amazing opportunity we have coming up in Northwest Arkansas to do something BIG. I mean, something really important. Actually, something that could have historical impact. Interested yet? First, a little self-disclosure. As you may know, I worked for the American Cancer Society for eight years, and just recently left there. 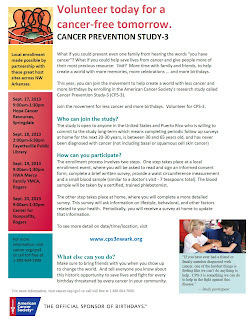 For the past three years one of my main projects was working on the Cancer Prevention Study-3 (CPS-3). I headed two enrollments in Fort Smith and started this one for Northwest Arkansas before I left. I'm happy to say, in Fort Smith, we successfully enrolled over 370 people into CPS-3. --Be between the age of 30 and 65. THAT'S IT! We want to enroll 500 people in Northwest AR, but there are plans to have 300,000 nationwide. This is a study that will be conducted by the American Cancer Society's national research department. You can be part of real, live research that will impact generations to come! It's a BIG DEAL. The first study done like this found the link between smoking and cancer. The second study found the link between obesity and higher death rates from cancer. We are anxious to see what this, the third study, will find. It's FREE to participate. I am enrolled, won't you do it too? What is involved? It's very quick and easy. You go to www.cps3nwark.org to choose your enrollment location and a time. This will ensure that you get a spot and eliminate time waiting in line. This will also allow you to complete the bulk of the questionnaire online at your convenience. On the day you choose, you come to the designated location to complete some additional paperwork, have your waist measurement taken by volunteers and then give a small blood sample which will be frozen. Everything is anonymous and no information will be shared. After that, you will receive questionnaires to update your medical information about every other year. These must be completed to remain in the study. Rather than make this a huge post, I'm attaching a photo of the informational flyer. You can click the photo to see a larger version. It has all the options for locations to enroll in NW Arkansas; in Fayetteville, Springdale and two locations in Rogers. I hope you will decide to enroll in CPS-3. 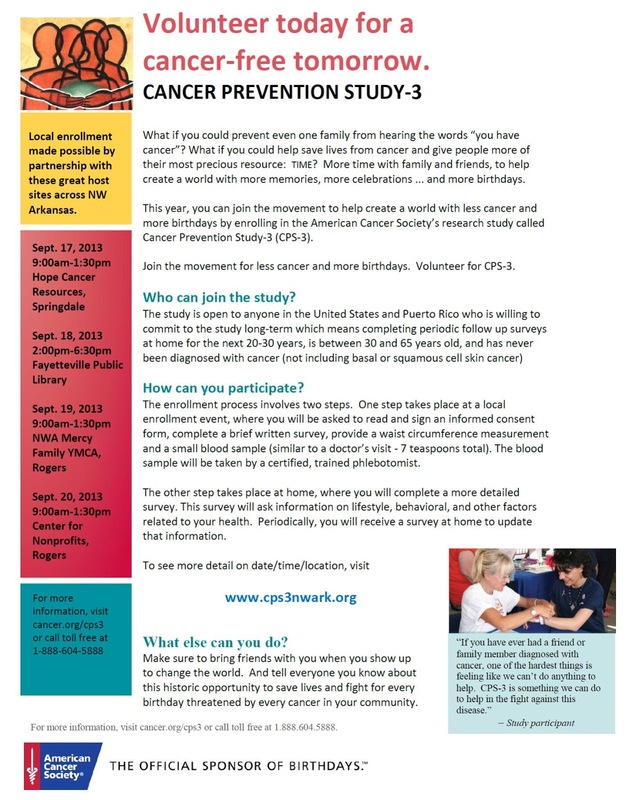 It's free, it's easy and it might lead to finding out something new about cancer. Wouldn't you like to do something important today? Please sign up now to make sure you get a spot. And please share this information with your friends and loved ones. --Doesn't matter if you are pregnant; you can still enroll. --Doesn't matter if you smoke; you can still enroll. No one is going to try to make you quit or judge you. --Doesn't matter if you have other medical conditions such as diabetes, high cholesterol or blood sugar, etc. Non-diagnosis of cancer is what matters here. --The blood sample is not for diagnostic purposes; no one will tell you if you have the above mentioned conditions or anything else.